NEW YORK�(CNNMoney.com) -- The Dow tumbled Friday after China's bid to limit bank loans and slower-than-expected European growth raised worries about the global recovery. But a late-session run up in select techs gave the Nasdaq a boost. A rallying greenback dragged on dollar-traded commodities, as well as companies that do a lot of business overseas and benefit from a weaker dollar. Where have you gotten the best financial advice? The Dow Jones industrial average (INDU) lost 45 points, or 0.4%. The Dow had dropped as much as 160 points in the morning before recovering. The S&P 500 index (SPX) slid 3 points, or 0.3%. The Nasdaq composite (COMP) rose 6 points, or 0.3%, thanks to gains in chip makers and other technology shares. Stocks had slumped heavily in the early morning, but managed to cut losses in the afternoon thanks to some gains in the tech sector. Investors may have also been reluctant to sell too aggressively going into a long holiday weekend. All financial markets are closed Monday for Presidents Day. "Between China and continued concerns about what the EU is going to do about Greece, there are a lot of negatives out there," said Tom Schrader, managing director at Stifel Nicolaus. He said that after a big run up over the last 12 months, people are looking at the negatives and are concerned about leaving any money on the table. "We can't seem to get an uptrend going. The selling has been on heavy volume and that makes people nervous," Schrader said. Stocks surged Thursday after the European Union agreed to help out Greece, but the advance was a rare bright spot in what has been a tumultuous start to 2010. 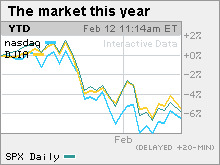 On the upside, all three major gauges were set to end with a weekly gain, after declining for four weeks. Tough start to 2010: Wall Street extended 2009's rally through the middle of January, but lost steam soon after. The Dow, S&P 500 and the Nasdaq have all declined the past four weeks as better-than-expected corporate profit reports have been overshadowed by worries about China slowing its growth, U.S. plans to limit bank trading and European debt issues. Also in play: the stronger dollar, which has pressured commodities and companies that do a lot of business overseas and therefore benefit from a weaker dollar. Between rally highs hit Jan. 19 and the lows of last week, the S&P 500 lost over 9%, careening close to the 10% selloff that is the technical definition of a correction. The Dow's high-to-low was just over 7%. Asia: China told banks to raise reserves for the second time in a month, in an effort to slow lending and contain any inflation threat that could set back the economic recovery. The government boosted the reserve requirement for financial institutions by a half-percentage point to 16.5% for big lenders and 14.5% for small lenders. Rural lenders will see no change. China kept its yearly target for bank lending unchanged, suggesting it isn't looking to cut back lending, so much as slow the pace. Asian stocks rose Friday, with Japan's Nikkei and other indexes ending higher. Greece: European Union members meeting in Brussels, Belgium, on Thursday said Greece must do whatever is necessary to cut its huge budget deficit and that the group would be prepared to step in if needed. In recent weeks, Greece's proposals to save money -- including cutting wages and raising the retirement age -- have prompted a series of worker strikes. Although Greece's impact is small, the nation's financial problems have sparked fears of a broader debt crisis in Europe with Portugal, Spain, Ireland and Italy among the other euro zone nations seen as having growing debt problems. U.S. investors have been trying to gauge what kind of impact such a crisis would have on financial institutions as well as the global economic recovery. Euro zone growth stalls: Meanwhile, a report showed that euro zone GDP growth in the fourth quarter was 0.1%, short of the 0.3% economists were expecting. Problems in Greece and a struggling German economy were among the factors dragging on growth. European stocks slid Friday, with London's FTSE 100 down 0.4%, the German DAX barely lower and France's CAC 40 down 0.5%. On the move: The B shares of Warren Buffett's Berkshire Hathaway (BRK.B) were among the most actively-traded on the New York Stock Exchange Friday. The stock was added to the S&P 500 after the close of trading. Managers of funds that mirror the 500-share average had to buy the stock ahead of the inclusion. Motorola (MOT, Fortune 500) gained 7.5% in heavy NYSE volume after announcing a long-in-the-works decision to split itself into two publicly-traded companies. Motorola is splitting its cell phone and cable set-top box business from its networking gear sales businesses. The company said late Thursday it will complete the deal in the first quarter of 2011. Market breadth was positive. On the New York Stock Exchange, winners beat losers eight to seven on volume of 1.43 billion shares. On the Nasdaq, advancers topped decliners three to two on volume of 2.26 billion shares. Economy: In the U.S., January retail sales growth was stronger than expected, according to a Commerce Department report released in the morning. The report, delayed by snow storms in Washington, showed sales rose 0.5% versus forecasts for a rise of 0.3%, according to Briefing.com estimates. Sales excluding autos rose 0.6% versus forecasts for a jump of 0.5%. A separate report from the University of Michigan showed that consumer sentiment dipped to 73.7 in early February from 74.4 in late January. Economists thought it would rise to 75. The dollar and commodities: The dollar rallied versus the euro and against the Japanese yen. The dollar's strength pressured dollar-traded commodity prices. U.S. light crude oil for March delivery fell $1.15 to settle at $75.28 a barrel on the New York Mercantile Exchange. COMEX gold for April delivery fell $4.70 per ounce to settle at $1,090. Bonds: Treasury prices rose, lowering the yield on the 10-year note to 3.69% from 3.72% late Thursday. Treasury prices and yields move in opposite directions. Should you buy Buffett's Baby Berkshires? Forget the Fed. Watch China instead. Job bill advances ... or does it?